Genre: Bloons is a puzzle game. It is very typical in that the game is a series of levels of increasing difficulty. 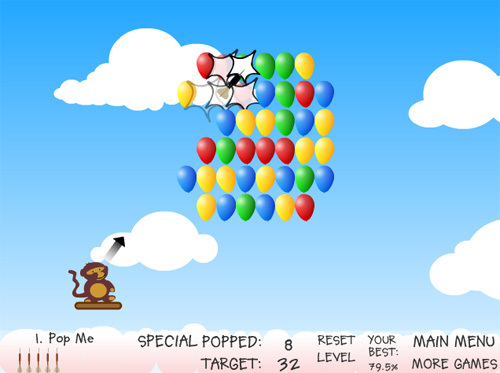 Bloons is unique in that it is probably one of very few games where a monkey fires darts at balloons. Interface: The only control available to the user is the mouse. The monkey does not move from its position on each level- the user only controls the direction of the dart and the power of the shot. Goal: The goal of the game is to complete all 50 levels (and for the obsessive, to complete each level with the maximum number of balloons cleared). Major challenge: The major challenge of the game is to fire the dart at the appropriate power and angle so that it avoids unwanted obstacles and hits desired objects. This can be very challenging at times. Rule set: The rules of Bloons are quite simple. The projectile darts fall back to the ground in an arc like we'd expect in real life. Special balloons and obstacles have specific functions that are introduced to the user as the levels progress. The rule set is fairly easy to follow. Competition: Bloons does not inherently have competition built into the game. However, each round can often be completed with a variety of strategies. By bringing a second player into the game, the competition of who can get the most perfect level completion turns Bloons from a puzzle into a game. Fun: 3/5. Bloons is insanely popular, probably because it's so addicting. It's very challenging to get perfect scores, and the game furthers the obsessive desire for perfection by tracking your best scores. Bloons can be very entertaining, but it's easy to get frustrated or no longer enjoy the game. Difficulty: 1/5 Bloons is very easy to learn. However, it's very difficult to master the game. Visual quality: 3/5 Bloons doesn't need great visuals, as it is so simplistic in nature, but its graphics are appealing all the same. Engaging: 2/5 Bloons is only as engaging as you want it to be. The player can fire shots with no time restrictions, and one can leave the game at any point and come back to where he or she left off. That being said, Bloons is incredibly addicting, and can draw someone in quite easily. Learning Difficulty: 2 == the controls themselves are very simple and it does not take long to figure out the general strategy. The difficulty arises from unfamiliar balloon patterns. Engaging? : 3 == Perhaps I did not get far enough, but the game is not difficulty enough nor is there enough user interaction for this game to be particularly engaging. However, the lack of in depth user interaction is part of the appeal of a flash game that is in many cases a procrastination tool. Recommendation: 4 == As a simple flash game that requires little time for familiarization, I would recommend it. Its appeal derives from the level variety and the feeling of success that come with only interspersed effort.